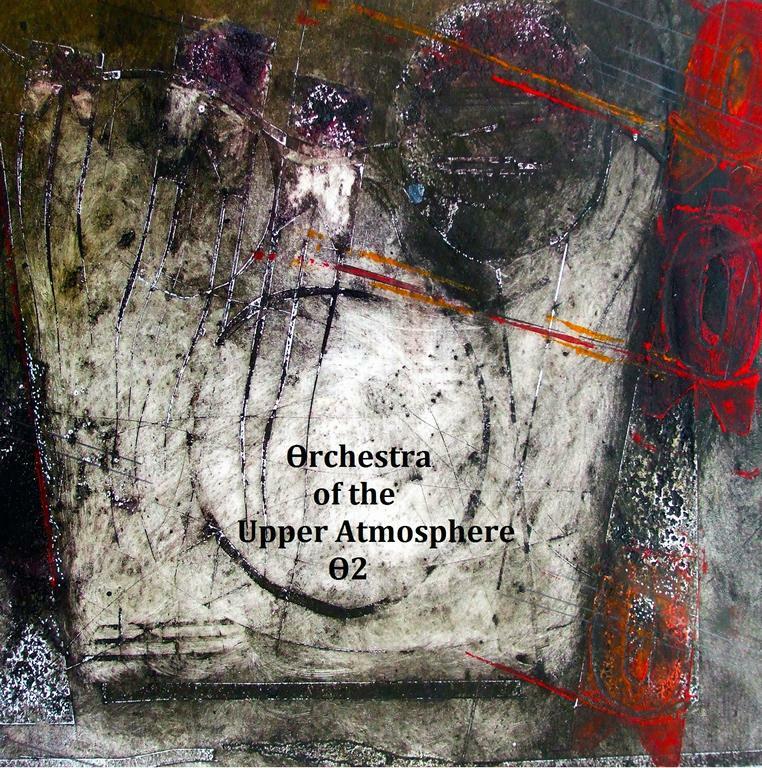 Orchestra of the Upper Atmosphere (OUA) are an 8-piece ensemble (plus numerous guests) that describe themselves as an “improvisation based rock group referencing the innovations of Terry Riley, Magma, Krautrock style exploration, Sun Ra and Alice Coltrane.” Wow, that’s an interesting bundle of analogies. If I had to limit this sprawling 150+ minute set to a simplistic description I’d characterize the music as Prog-Jazz-Funk-Space-Ambient-Electronic-Noise Avant-Everything. It’s actually more cohesive than these descriptions suggest, and after several listens I’ve got a feel for the way OUA draw on their varied influences and, most importantly, the way they meld various musical styles and influences into something refreshingly unique. We’ve got a lot of musicians contributing and an array of instrumentation including organ, electric piano, synthesizers, electronics, samples, bass guitar, Eb saxophones, clarinets, VST trumpet, alto and bamboo flutes, electric violin, violin, viola, cello, glockenspiel, drums, percussion, and the 20 voice Juxtavoices choir. The two names I recognize are Discus Music mainstay Martin Archer and Steve Dinsdale of Radio Massacre International. There are 11 tracks across two CDs and only the grand tour will provide a sense of the breadth of influences that inform this music. The fun begins with Dominant Growth Direction, which starts off like a chamber ensemble performing a manic, shot into space Carl Stalling score, but then eases into a Space-Jazz rocker that has a cool grooving rhythmic pulse, swirling minimal synth patterns and spacey atmospherics, wild Sun Ra styled keys, and howling ensemble vocals. For the last several minutes the music eases into dreamy and playfully sound experimental atmospheric Space and Jazz rock with an Avant-Classical finale. The continually evolving Paratacamite kicks off with an intense score that brings to mind Philip Glass, followed by introspective and dreamily melodic vocal drift, and then a stimulating combination of minimalist patterns, Sun Ra keys, and deep space soundscape yet rhythmic driven Rock. Bilateral Coordination Activities Are Calming is a sound and ambient exploratory chamber ensemble in space piece. Modus consists of cosmic Space-Jazz, like 70s Funk-Fusion meets Sun Ra on the Forbidden Planet soundtrack, or perhaps David Torn’s Cloud About Mercury performed by the San Francisco band Mushroom. Noctilucent is an intensely orchestral ambient-soundscape exploration, peppered with oodles of alien effects, a light World Music feel, and shepherded along by Dub grooves. Space Smells Of Strawberries features floating and freaky space electronica, Dub, and Orchestral-Jazz and Fusion, sometimes with an epic film soundtrack feel. Across The Atmospheric Eddies is bewitchingly ethereal, with howling, spectral voices that get downright freaky at times, all amidst a cosmic rocking, jazzy, orchestral vibe. RMMV Asturias is similar, including all the eerie voice activity, but is more purely ambient/soundscape oriented, though the music eventually takes on a somewhat tribal quality as the piece progresses. The Breaking Of Bonds & The Rearrangement Of Atoms is a Prog infused blend of cosmic orchestra, space electronic excursion, and sound sculpture. Think Jean Luc Ponty, Klaus Schulze, Can and Terry Riley collaborating at a Psychedelic planetarium Jazz lounge. Curvature Of The Earth is a cool grooving combination of orchestral elements, smooth lounge Jazz, spacey symphonic Prog keys, Ozric Tentacles synths, and bits of spaced out Soft Machine. And, finally, Potent Lunation is a rumbling rush of atmospheric, orchestral, Free-Jazz rocking Space-Prog. I like the combination of busily kinetic percussive patterns and ominous bass throb that anchors the thematic churn of symphonic keys, chaotic alien effects, and wailing Free-Jazz horns and strings. The last segment becomes quieter and more sound experimental, teetering between ambience and chaos, before slowing increasing in intensity for a darkly operatic climax. In summary, this an ambitious effort, being quite different but by no means abstract. It’s adventurous yet accessible, and a real challenge to adequately describe, but huge fun to free my mind and let the impressions flow. If you’ve read this far and are the least bit intrigued, I highly recommend taking the plunge into this step outside the box.